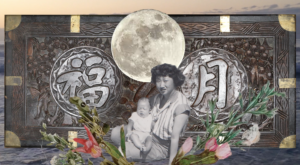 My work included in Descendent Threads is rooted in a reverent response to the mysteries that were always part of having a lovely Chinese mom. Watching her use her elegant and enigmatic tool for counting inspired wonderment. 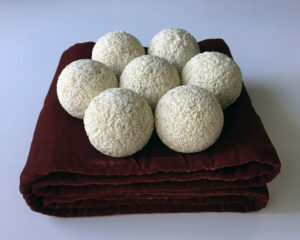 For ABACUS, I cast seemingly countless grains of rice into oversized bead forms. 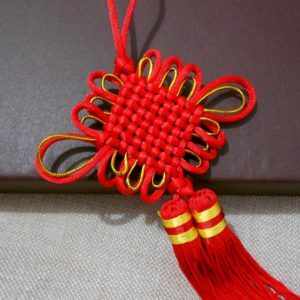 But instead of aligning on a rod, they are arranged like a blossom that rests upon a coiling velvet cushion. My mom spoke a language I could not understand, but in which she seemed her most buoyant while speaking. In making TRANSLATION, I have taken apart a Chinese-English dictionary. Using a pattern she taught me as a child, I’ve folded each page into a small boat. These 400 boats follow each other in a double spiral, out and in, across hand-drawn lines. These red lines are the battens of a sail, latitude/longitude lines, or the lines on the pages of a calligraphy practice book. 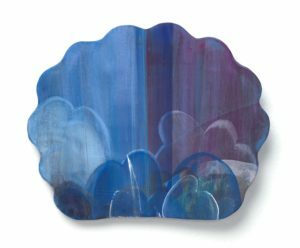 In the surfaces of my FAN SUITE paintings I see the influence of my mother’s Chinese “dreamstones.” As a child I was transfixed by these thin slices of stone, mounted in carved hardwood frames and revealing inclusions and veining that resembled landscape. I am fortunate to have with me now, many treasures my mom was able to bring with her to America, and that I grew up with, including her fans. 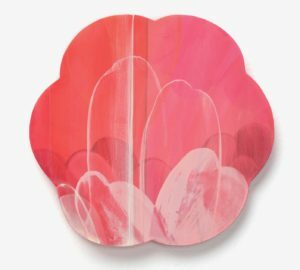 The shapes I use in the on-going painting series I call FAN SUITE are based on 17th, 18th and 19th century Chinese fans. There is the tradition of these fans to depict flora and landscape, suggesting that their restorative breeze could transport us to these lovely fresh scented locations. My great-grandfather was Rev Chan Hon Fan. 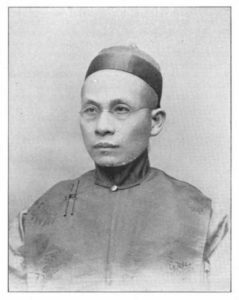 As a young man he was a missionary working with the Chinese Methodist Episcopal Society along the Pacific Coast from Puget Sound to the San Francisco Bay Area,1870-1900. 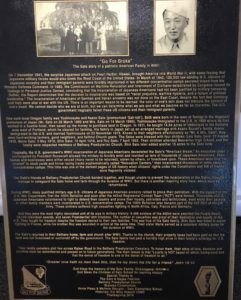 The Oregon Historical Society has documented a letter written by him and published in the Oregonian in 1886. It was printed in his exact words, and titled A Chinaman’s Letter. Chan Hon Fan was living and working in Portland, OR, when his daughters, my great-aunt Clara Elizabeth Chan Lee (b.1886) and my grandmother, Laura Chan Chu (b.1885), were born. As a young woman my grandmother married and joined my grandfather in his return to China. They were living in Hong Kong when my mother was born. My mom’s childhood and education were in Guangzhou and Hong Kong. She was a physician working in Guangzhou when, as she put it, “the communists walked in.” Within a few months she defected to Hong Kong, eventually making her way to Texas. I was born on Galveston Island, and I am an American-born first generation Chinese artist. 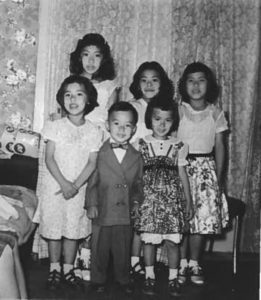 Growing up in the 1960’s, in that particular Gulf Coast community, my family was a rarity; there were no other Chinese families. I was fortunate for regular trips to Los Angeles and San Francisco, visiting grandparents, aunts, uncles and cousins living there. Those Chinatowns were my first experiences of immersion in Chinese community. In the 1990’s, I came to live in the Pacific Northwest with my own young family. Right away, I joined for a short while, a cooperative artists gallery that was located just across the street from where Portland Chinatown Museum is now. It was then I first learned from my mom that my Grandma Chu and Aunt Clara were born in Portland. What a welcome revelation to know I had such deep, personal connection, reaching far back in time, to my new home! I eventually would learn more family stories. So many were tales of displacement, running, assault, more running, loss of every kind…but always enormous resilience and service to others. Horatio Law and Roberta Wong are among the first artists in Portland I came to know; I was captivated by one of Horatio’s early multi-media installations in the Motelhaus Portland project, 1998. A few years later Roberta curated my solo exhibit during Asian Pacific American Heritage Month at Interstate Firehouse Cultural Center. 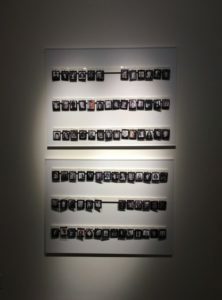 I recently had the honor to be included by Lynn Yarne in her video presented at Open Signal, Portland, “Don’t Forget Who You Are Or Where You Are From.” I am deeply grateful for connection to these artists through our exhibit together at Portland Chinatown Museum. My mom passed away as we were installing our exhibit, Descendent Threads, and this timely coincidence has deepened a sense of longing to belong. I cannot forget her treasured objects and stories. Through the work I have developed for this exhibit I bring them forward with me into the future. BIO: Ellen George attended Austin College, Sherman, Texas, and the National College of Art and Design, Dublin, Ireland. She has lived in Washington State over twenty-five years. 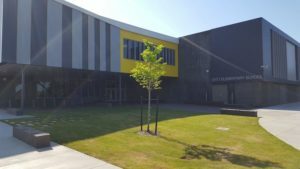 Ellen has received residencies at the Sitka Center for Art and Ecology, Otis, Oregon, and c3:initiative, Portland, Oregon. Her work is included in numerous collections including Portland Art Museum, Tacoma Art Museum, 4Culture and King County, Seattle Public Art, The Nines Hotel Atrium, Portland, Oregon Health and Science University, Portland, and the Collection of Jordan D. Schnitzer. 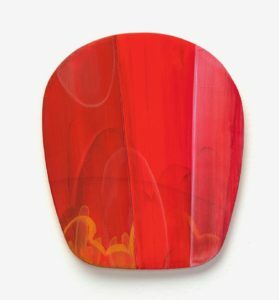 Ellen is represented by PDX CONTEMPORARY ART, Portland, Oregon. She will have a solo exhibit there in May 2019. I was born the Fifth Chinese Daughter, another parental effort for a First-Born American son. My birth order enabled me to grow up learning how to exist on the fringe ­– amongst my siblings, within my community, and in American society. Hypocrisy, social injustice and gender bias were some things I was consciously aware of from an early age, but it took decades before I was able and willing to call them out. My Confucian family life taught me that I was part of a whole, and there was order and purpose to our lives. Each person had value regardless of position, size, role or status. My Taoist perspective put our lives in context with the Universe. As an artist, I acknowledge that we each are originals ­– individual beings obligated to be our true selves. We mix and blend materials with concepts to explore and tap our humanity. Our work as social alchemist is in creating intrinsic value within each discovery, either a revelation of self or shared universal truth. Despite social or commercial trends, it is of importance to adhere to one’s vision to find personal truth. Recently I returned to Chinatown to participate in the second exhibition of the newly-opened Portland Chinatown Museum. 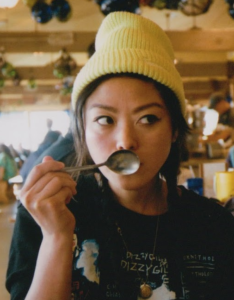 Curated by Horatio Law, three Asian American women artists were selected to share their disparate paths and personal connections with Portland’s Chinatown. “Descendent Threads” exhibited Ellen George, Lynn Yarne and myself, Roberta Wong. In addition to mutual cultural experiences, Asian Americans have experienced the history of exclusion, racism, violence, murder, social injustice, discrimination, and inequality. Much of my art addresses these social/cultural issues. 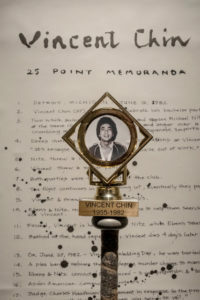 With titles like Chinks, All-American, All Orientals Look Alike, and Vincent, most of my pieces, accompanied by a written artist statement, are meant to challenge the Asian American narrative. I am hoping that those who experience my pieces will feel a shared visceral response that is both disturbing and self-affirming. Our visibility makes our lives relevant to ourselves and to others. Steel pedestal, plastic tray, toy cars, aluminum baseball bat, plastic/marble trophy, Chinese scroll, brush pen ink. 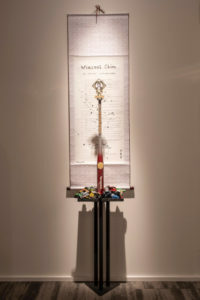 Artist Statement: I-Ching Revolution: 101 visualizes social change and its manifestation through personal courage as represented by small action. When individuals consciously stand with BLACK LIVES MATTERS and “show face” against the injustices confronting our Black communities, lives will change. I invited photo submissions from the community; this simple act of “showing face” symbolizes the courage it takes to face up to social, political, and economic consequences. Join the revolution, manifest the change. Ellen’s grandmother was born in Portland’s Old Chinatown in the late 1880s. Her grandfather, a young Chinese sojourner, returned to China with his wife where Ellen’s mother was born. In time, her mother came to the U.S. and settled in Texas where Ellen was born. It was only recently that Ellen learned of her grandmother’s connection to and family roots in Portland’s Chinatown. 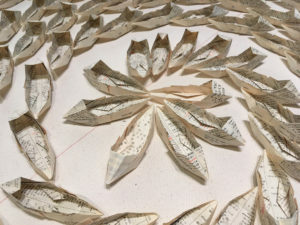 Her art – object-making installations and paintings – are reflective of loving memories of her mother in the comfort of familiar tools: her abacus, her fans, and her language. 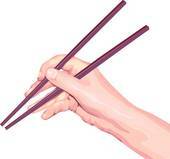 Lynn recalls family visits to Chinatown as a child eating at their favorite restaurant. 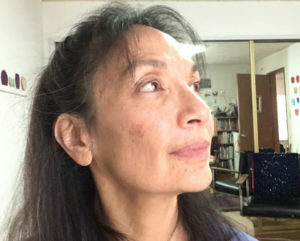 Her two grandmas, although living across the street from one another, recalled different lives­ – one centered in Chinatown, the other in Portland’s Japantown. 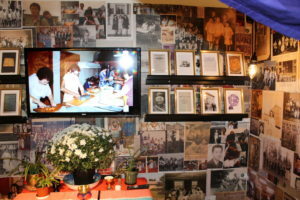 Honoring the women in her life, Lynn constructed a community altar, gathering multitudes of photographs to depict a blending of her families, cultures, and histories. These became the basis for her animated video which captured the movements, sounds and stories within an enshrined space. 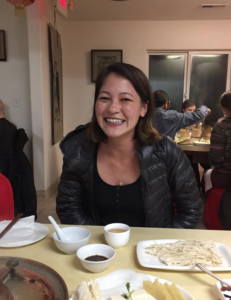 BIO: Born and raised in Portland, OR, Roberta Wong grew up working behind the counter and in the back kitchen of her family’s grocery and restaurant, Tuck Lung, in Portland’s Chinatown. She attended Portland State University, graduating in Sculpture in 1983. 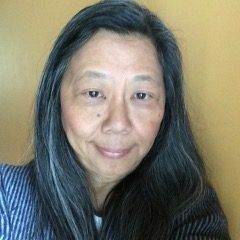 Chinatown was a part of her daily life until 1985 when she entered the nonprofit art sector as a gallery director and art administrator. She spent the next two decades promoting diversity in the arts and creating opportunities for artists-of-color. 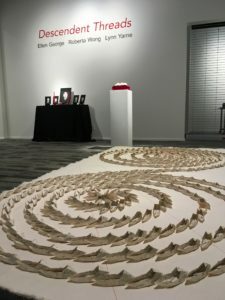 Recent exhibitions include Portland Chinatown Museum, Artists Repertory Theatre, and Indivisible; past exhibitions: Wing Luke Museum, Interstate Firehouse Cultural Center, Evergreen State College, Portland Community College-Sylvania Campus, Portland State University-Autzen Gallery. Her artwork is published in Where Are You From? An Anthology of Asian American Writing, Thymos, Portland, OR, 2012 (Shelf Unbound award); Myth and Ideology Study Guide: Surviving Myths, Deakin University, Australia, 1990 & 2000 and The Forbidden Stitch: An Anthology of Asian American Women Artists, published by Calyx, Corvallis, Oregon (American Book Award, 1990). I grew up on John Hughes films – Pretty in Pink, Some Kind of Wonderful, Sixteen Candles – I watched them before I was old enough to fall in love, to feel rejected, and to dream about who I would ultimately end up with. I also watched them before I was old enough to consciously think about the fact that no one in that world ever fell in love with an Asian character. In fact, the only Asian character that seemed to exist in that world was Long Duk Dong, an exchange student who spoke in broken English and developed a crush on Molly Ringwald’s character, Samantha. But Samantha would never ever consider him as a possible romantic interest; that, after all, was the joke. And though I never found the joke funny, I continued to watch romantic comedies, enjoying the stories but never finding anything in them particularly realistic or accessible. In addition to my love of movies, I am an avid reader and a big fan of so many books by and about Asians and Asian-Americans. Among my favorites are the novels about multi-generations of families moving between and within countries. This past year, I relished Min Jin Lee’s Pachinko, Lillian Li’s Number One Chinese Restaurant, and Lisa See’s Shanghai Girls and Dreams of Joy. These books are varied in subject matter and writing style, yet they are all the stories on some level of people facing financial or familial hardships and forced to make tragic decisions. While I come back to these types of books time and time again, it had not really dawned on me until recently that I may actually view and identify with the “Asian story” as only about overcoming hardships – and learning to endure to create a better life for someone else. While the stories always hold some hope, they aren’t uplifting. In other words, these books aren’t exactly romantic comedies. But, they are the only stories I found myself identifying with – and what did that say about how I viewed myself? So, imagine my surprise, when I picked up Kevin Kwan’s highly acclaimed novel Crazy Rich Asians (and subsequently China Rich Girlfriend, and Rich People Problems) and entered the world of the wealthy Asian elite who travel by private jet for weekends on private islands and private yachts and think nothing of $30,000 handbags and $20 million wedding celebrations. It is a world where highly attractive Asian people fall in love with each other, where they experience all the ups and downs of dating, engagements, and parents who don’t understand. While there are certainly some very “Asian” elements portrayed through the familial relationships, these weren’t the tragic Asian novels I was used to reading. And when Crazy Rich Asians was brought to the big screen, with its bursts of vibrant color, catchy pop soundtrack, beautiful wardrobes, and an entirely Asian cast, it certainly wasn’t the romantic comedy of my youth. I had a smile on my face through the whole movie, even when the dialogue made me cringe a bit, or I found the plot twists predictable or far-fetched. It just felt exciting to see a familiar story told in a way that actually felt familiar to me. 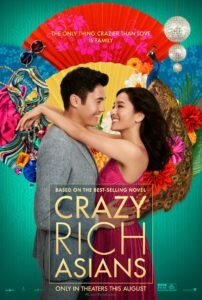 I am not, nor will I ever be, a crazy rich Asian, but finally here was a story that was fun, without making fun – that made everyone (including non-Asians) want to be a part of that world, or at least enjoy watching it from the outside. Finally a romantic comedy with characters leading lives we could see ourselves in – lives that we need to see ourselves in. 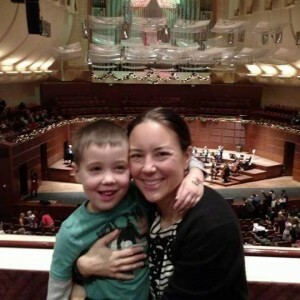 Bio: Anne Hawkins is a criminal defense attorney in San Francisco, California. She lives in the Bay Area with her husband and three children. 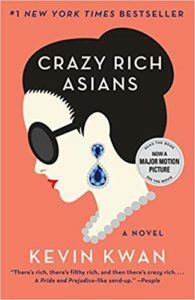 Until Kevin Kwan comes out with his next novel, she is on the lookout for other happily-ever-after novels featuring Asian and Asian-American characters. Recommendations welcome: annehawk@yahoo.com. 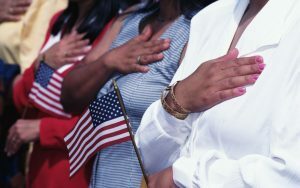 While growing up on Guam, I never really took the time to think about what my race and ethnicity meant to me. I was very comfortable because I identified as Chamorro, part of the majority race on Guam. Wherever I went, I felt like I belonged and could connect easily to others around me. 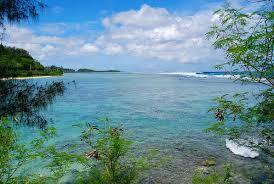 Attending college in the States, I expected that a lot of people wouldn’t know much about Guam, much less Chamorrros. Given the location of the island and its lack of media representation, I knew that I would have to answer a lot of questions about my island and my culture. Raised as a military child in the Department of Defense education system on Guam, I was taught how to formally explain the island and my racial background. However, it didn’t occur to me that the shift of demographics, from Guam to this new mainland environment, would change the expectations and assumptions that others brought to the conversation. Initially, I really enjoyed telling people about my background and where I had come from. Many students showed a genuine curiosity in my stories and I felt like I was able to be myself around this new group of people. It also helped that I have an extreme sense of pride in my cultural roots and I didn’t encounter anyone who seemed disinterested in what I was saying. But, as I continued to interact with people here in Portland, I began to notice that the questions and assumptions that some have about islanders are pretty ridiculous, to say the least. Some people praise my English. Some ask if I had worn “real” clothes before and just generally question whether my island is a “civilized” community. On top of the assumptions that people have about islander communities, I am also really bothered when people assume I am a member of the Latinx, Asian, or Native American communities and treat me in ways that reflect their assumptions of those groups as well. A common assumption that others have of me is that I am a Latinx man, which is either said explicitly or when they greet me in Spanish. I am often faced with the discomfort of navigating out of those situations, especially when I realize I am being engaged because they think I’m of that other race. But of all the assumptions I encounter, I really dislike the one that disbelieves that those of us born on Guam are “real” Americans. Many people ask me if I am a legal citizen and many places do not accept Guam ID as a proper form of valid identification. 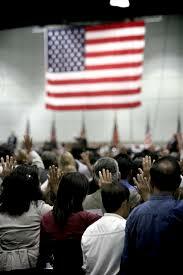 Many of us from Guam have to carry our passports around to prove our American citizenship. I am continuously asked to validate my presence here in the United States. I am baffled and frustrated. BIO: Brandon Cruz is a member of the field team at APANO, the Asian Pacific American Network of Oregon. Born and raised on the island of Guam, Brandon came to Portland to complete a degree in social work and psychology at the University of Portland. He identifies as a native Chamorro and is interested in creating systemic changes, mental health, and the relations between territories and the US. During his free time, Brandon enjoys playing guitar, hiking, spending time with friends, and exploring the food scene in Portland. My last name is the nightmare of substitute teachers. Kobayashi-Solomon. It doesn’t fit on the back of a soccer jersey, and it takes what feels like an eternity to scrawl out all 17 letters when I’m signing a document. There have been plenty of times when I’ve wished, for the sake of convenience, that I could delete the hyphen and simply call myself Elai Kobayashi or Elai Solomon. Nevertheless, I am Elai Kobayashi-Solomon. And, as I’ve grown older, I’ve begun to realize that the seemingly innocuous hyphen which rests between the two halves of my last name is symbolic of my experiences as an Asian-American growing up in Chicago and attending college in Portland. I was born in a small town just outside Tokyo to parents who had struggled to find a place to call home. 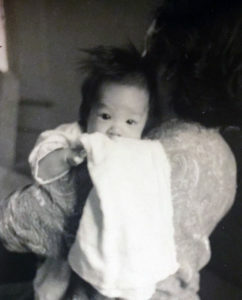 My mother, who was born and raised in Japan, left her family behind and immigrated to the United States in search of bigger and better things when she was 23-years-old. My father, born in Houston, never felt comfortable in the conservative religious household in which he was raised, and he left the lone-star state for Tokyo in his mid-20s. They met in Japan, and, upon having me, decided to merge their last names into a single larger one which reflected their two distinct cultural identities: Kobayashi-Solomon. My family moved to the United States when I was roughly three-years-old, and I spent the majority of my childhood and adolescence in a suburb of Chicago. Growing up, I constantly struggled to reconcile my Japanese and American identities, which often seemed completely separated by the hyphen that lay between them. On the one hand, raised in the United States, I attended public schools that were majority white, watched American television shows, and read about American news and politics. But on the other hand, I spoke Japanese with my mom, attended Japanese Saturday School, and was more comfortable eating with chopsticks than a fork and knife. I had the clear sense that I wasn’t completely American or completely Japanese, and there were times when I felt as though I was hopelessly caught between two cultures while never being entirely part of either. Recently, though, my outlook has changed. I’m not exactly sure why. Maybe it has to do with my trip to Japan a couple summers ago. Or maybe it was triggered by my new life as a college student in Portland, a city without much of a Japanese community, especially compared to that of the Chicagoland area. Walking through the bustling streets of downtown Tokyo in the summer of 2016, I felt simultaneously at home and alien. It had been several years since I had visited Japan, and I felt a deep, visceral attachment to both the city and the people who passed me on the streets. However, as I glanced at posters of celebrities I didn’t recognize and caught snippets of slang that I didn’t understand, I was also acutely aware that I was not too different from the hordes of tourists who arrive each year, marveling at unfamiliar cityscapes and cultural customs. My experiences in Portland have been in many ways similar. Without Japanese friends, acquaintances and family members to speak to, I could, if I wanted to, become Elai the American college student. However, before I even realized it, I felt myself being drawn towards elements of my Japanese background and heritage, whether it was via my work for APANO or the late-night ramen trips I sometimes make with friends. When I was in high school, these experiences may have led to feelings of isolation, confusion, and separation. But, thrust into a new environment with plenty of time to reflect, I realize that it needn’t be so. True, I may never feel totally at home walking into a Japanese konnbini or watching the Superbowl with friends. 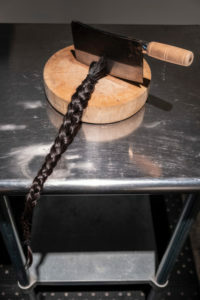 But, if I was simply Elai the American, I would have never had the opportunity to attain fluency in a foreign language, fly across the Pacific Ocean to stay with my obaachan, or learn kendo from a Japanese sword-fighting instructor. And if I was just Elai the Japanese, I wouldn’t be sitting here now attending a liberal arts college (non-existent in Japan) alongside many valued friends and peers. The hyphen sitting between “Kobayashi” and “Solomon” doesn’t have to be an impenetrable wall, forcing me into a binary choice between Japanese and American, neither of which I feel comfortable completely adopting. 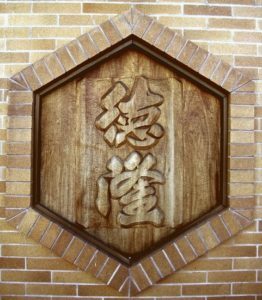 Rather, the hyphen is a bridge — an open connection that lets me combine and explore elements of both my Japanese and American identities, the whole greater than the sum of its parts. 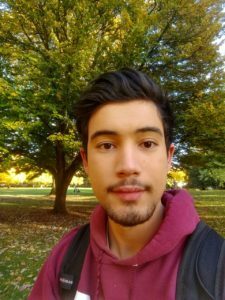 Author Bio: Elai is the Cultural Work & Placekeeping Intern at APANO. Born in Tokyo, Japan, Elai moved to the United States when he was three-years-old and was raised in Chicago, Illinois. Currently, Elai is an English major at Reed College. 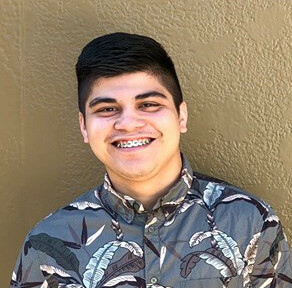 Through his internship at APANO, Elai hopes to learn more about nonprofit and social justice organizing, a field which he wishes to pursue in the future. 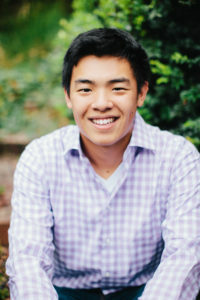 In his free time, Elai enjoys reading, listening to podcasts, playing soccer, and writing for Reed’s student newspaper. http://www.literary-arts.org/what-we-do/oba-home/fellowships/fellowships/. Contact Susan Moore with questions, Susan@literary-arts.org, or 503-227-2583 ext 107.